Though breakouts, otherwise known as escape rooms, have just recently become popular in the classroom, the concept behind these learning experiences has existed for over 20 years. Breakouts as a classroom activity are modeled after escape rooms, which are physical adventure games in which players solve a series of puzzles and riddles using clues, hints and strategy to escape from a room. These real life escape rooms were inspired by "escape the room"–style video games, which similarly have various puzzles and riddles themselves follow the theme of the room. The format of a room or area containing puzzles or challenges has also been featured in multiple TV game shows. Unlike real life escape room games, in classroom breakouts students are not trying to escape a physical location, but instead must solve a series of puzzles in a specified amount of time, usually a class period, to unlock various locks on a box to reach whatever is placed inside the box. A breakout can be done using a physical box and locks, in an online format, or some combination of the two. 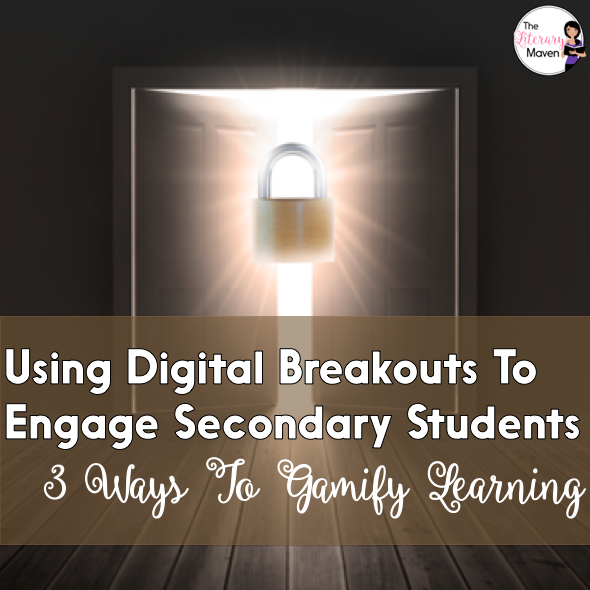 I prefer digital breakouts because they don't require any special equipment, just the use of technology, and once the digital breakout is created, there isn't any set up time either. Breakouts builds classroom community as students must work together either in partners or small groups to complete the task. 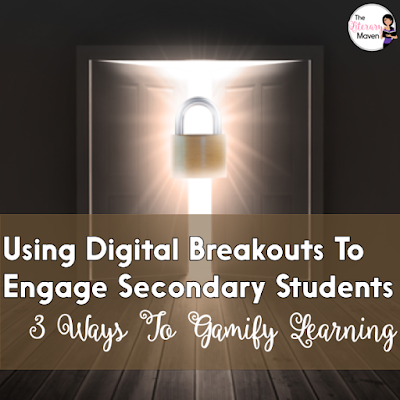 These fun activities usually include a plot that sets the purpose for the breakout and most students respond well to a little healthy competition to see who can successfully get the end first. Creating puzzles within breakouts that require students to use certain skills or content knowledge also makes these activities excellent forms of alternative assessment. These activities are designed to be challenging. There isn't a step-by-step set of directions for students to follow and many times there is no set order in which students must proceed. Different students will uncover different information at different times, and even after uncovering that information, they may not immediately know how to use it to unlock a lock. Sometimes all of your students may successfully break out, and other times few or none will (and that's okay; I've tried breakouts as an adult that I haven't successfully completed). This type of activity may be uncomfortable at first for some students, especially those who always want to know exactly what they need to do to earn X grade, and even for some teachers, especially those who aren't accustomed to letting their students struggle and work things out on their own. However, it is important to remember that breakouts are intended to promote out of the box, critical thinking as well as a growth mindset as students must try again after each failed attempt to unlock a lock. One way I use digital breakouts in my classroom is to reinforce and review skills such as plot and setting, conflict, characterization and character types, point of view, theme, irony, symbolism, and figurative language. I find that while my students have often already had exposure to these literary elements, they do not have the definitions committed to memory and lack a deeper understanding of the terms. Instead of just taking notes or practicing with a drill and kill worksheet, using breakouts allows students to interact with different types of texts (short stories, fables, poetry, film clips, etc.) and engage in purposeful academic conversation with their peers. They become active learners, helping and correcting each other, and excited about the learning process as they uncover each piece of new information and solve each lock. Another way I use breakouts in my classroom is to preview or review novels or other texts we read as a class. When used to preview a text, breakouts can introduce the characters, setting, and plot or help build background knowledge of an issue or historical time period in the text. Similarly, a breakout can be a fun way to review the elements of a story after completion of reading or serve a s a reward for students' hard work during a novel unit. For example, when teaching The Outsiders by S.E. Hinton, I use a breakout to pique students' interest in the novel and introduce them to cultural influences on the novel. Students watch music videos of Elvis and the Beatles, and read articles about the Vietnam War and drive-in movie theaters. Students also learn about the author and read the Robert Frost poem, "Nothing Gold Can Stay," the inspiration for one of the novel's most famous lines. Students will use information from this variety of text and media to find the codes that will unlock a series of locks so they can try to prevent a rumble between the Socs and the Greasers. Similarly, since the length of The Odyssey by Homer can be daunting and the cast of characters and numerous events in the plot can be difficult to keep track of, I find that a breakout is the perfect way to get students familiar with it all. Students are introduced to literary terms connected to epics: plot, themes, invocation of muse, in media res, epic similes, dactylic hexameter, stock epithets, and epic heroes, as well as some of the major characters. A video about the historical accuracy of The Odyssey and a tour of the stops on Odysseus's journey home are also part of the breakout. Finally, I have also used a breakout as an activity on the first day of school. I've never liked standing at the front of the classroom, giving the same speech over and over, class period after class period. And if it is boring for me, I can only imagine how boring it is for my students. In the past I have changed things up a bit by using stations, but this year I wanted to do something completely different. I wanted the first day to be an opportunity for students to interact while engage in an activity that was fun and exciting, but also academically purposeful. Inspired by the Jules Verne novel, Around the World in 80 Days, in this back to school breakout, students followed Phileas Fogg's route around the world as they learned about the back to school traditions of different countries. Student used close reading and soft research skills to successfully complete the breakout. It also encouraged collaboration between students and out of the box thinking. While students were working on the breakout, I was free to walk around the room and interact with groups and individual students, a much better alternative to being tied to a PowerPoint presentation at the front of the room staring out at a sea of faces. I also had the chance to start to learn about them as learners. Who worked well with others and who preferred to work alone? Who stood out as a leader or a mediator? Who was excited by a challenge and who shut down when success was not immediate? You can find all of my breakout resources here. If you are interested in creating your own digital breakout, you can read about my planning process here and find resources and ideas for activities here.